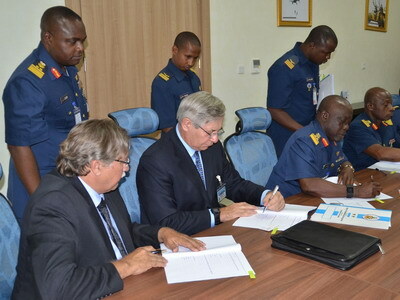 The Nigerian Air Force (NAF) has signed a memorandum of understanding (MoU) on the production of multirole light utility aircraft with US manufacturer Comp Air Aviation. The agreement was signed on 11 January in line with the Chief of the Air Staff’s vision to promote self-reliance within the Nigerian Air Force. The NAF said in a statement that it had authorised a Research and Development (R&D) team to partner with three American aviation companies to embark on the in-house production of a light utility aircraft dubbed NAFSA Eagle. “Having excelled in the collaboration arrangement among the three companies, the NAF decided to sign a MoU with Comp Air Aviation in order to have a legal framework under which the R&D collaborative effort will work,” the NAF said. Speaking during the MoU signing, the Chief of the Air Staff (CAS), Air Mshl Sadique Abubakar (represented by Chief of Policy and Plans, Air Vice Mshl James Gbum) said that the collaboration underscored the need to seek self-reliance through technology acquisition to develop indigenous capability for the production of defence equipment. Comp Air Aviation CEO Ronald Lueck said that his company would work assiduously with the NAF R&D team. Comp Air Aviation (formerly Aerocomp) is based in Florida and specialises in the production of a family of composite kit-built aircraft ranging in size from four to ten seats and powered by engines from 180 to 1 880 hp. Comp Air says it has produced several hundred aircraft over the last quarter century. The company started out producing floats for seaplanes before branching out into kit-built aircraft. A dozen different designs have been built, including the Comp Air Jet which first flew in 2004. The Nigerian Air Force is also pursuing the production of unmanned aerial vehicles (UAVs), and on 4 October 2016 signed a memorandum of understanding with Portugal’s UAVision regarding the production of UAVs in Nigeria. At the time the NAF said the collaboration had led to production of four UAV prototypes with two each produced in Nigeria and Portugal. The Nigerian Air Force did not disclose what type of UAV it would be acquiring under the joint venture. UAVision makes several different types of UAVs, including quadcopters and several small fixed wing designs ranging from 10 to 25 kg. The Nigerian Air Force unveiled its first indigenously produced UAV, the Gulma, in December 2013, and said the aircraft would be deployed as an intelligence, surveillance and reconnaissance (ISR) platform in the fight against terrorism, maritime piracy and crude oil theft. The Gulma was produced by the Nigerian Air Force Institute of Technology (AFIT) with the help of aerospace engineers from Cranfield University in Britain. Since 2007, the British institution has partnered the AFTI as part of the Nigerian government’s bid to develop an in-house capacity for advanced aviation design, research and development. The NAF acquired nine Aerostars from Israel’s Aeronautics Defence Systems (ADS) between 2006 and 2007 and several CH-3 UAVs from China, which have been used against Boko Haram militants.